The Southern Baptist North American Mission Board (NAMB) almost missed them. And it would’ve been a big miss. Mike McDaniel is an electrician and handyman who specializes in restoring power after natural disasters. He’s seen the wreckage of nine hurricanes, including Hurricanes Andrew (“the worst”) and Katrina. His wife, Linda, occasionally visits him on the job. Her father was a construction contractor; she’s helped to flip many a house. And for years, the two of them have wanted to volunteer to help after disasters. The McDaniels attend a Baptist church, and Linda would go online to look up the North American Mission Board’s disaster relief efforts. “They said you had to be trained,” she said. But training was offered only a few times a year, and not always locally. So the couple always passed. But this summer, NAMB waived the training requirement, experimenting to see if it would lift the falling Southern Baptist volunteer base. The Southern Baptist Convention’s disaster response is so massive it financially trails only the Red Cross and the Salvation Army—and has more trained disaster relief volunteers than either one. The couple pitched right in, tearing out flooring, assessing damage, making repairs, and getting one family connected with a shower, laundry, and a hot meal. As soon as they got home, Mike and Linda looked up the training courses again. “We’re both going to do the training,” Linda said. So next time, they won’t have to wait: “When there’s a disaster, [NAMB] will call you up. 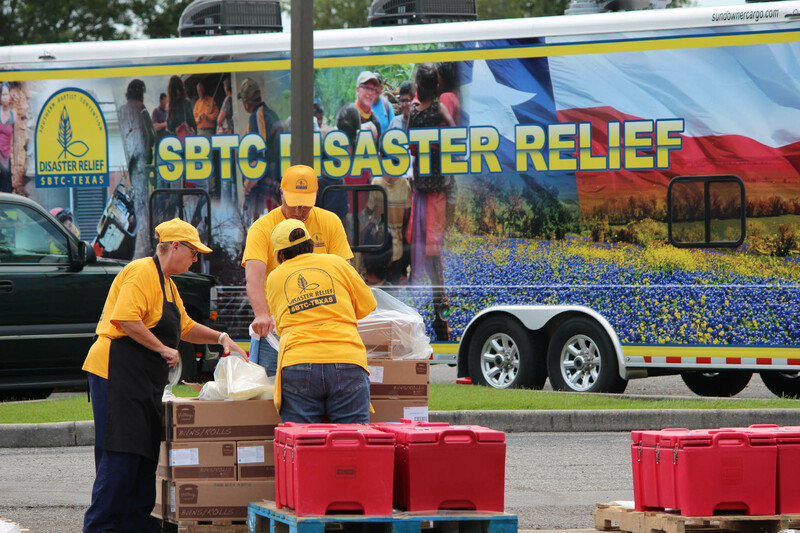 Southern Baptists already have 65,000 trained volunteers; the Southern Baptist Convention’s (SBC) disaster response is so massive it financially trails only the Red Cross and the Salvation Army—and has more trained disaster relief volunteers than either one. In September, President Trump acknowledged each of “the big three” for their Harvey response. 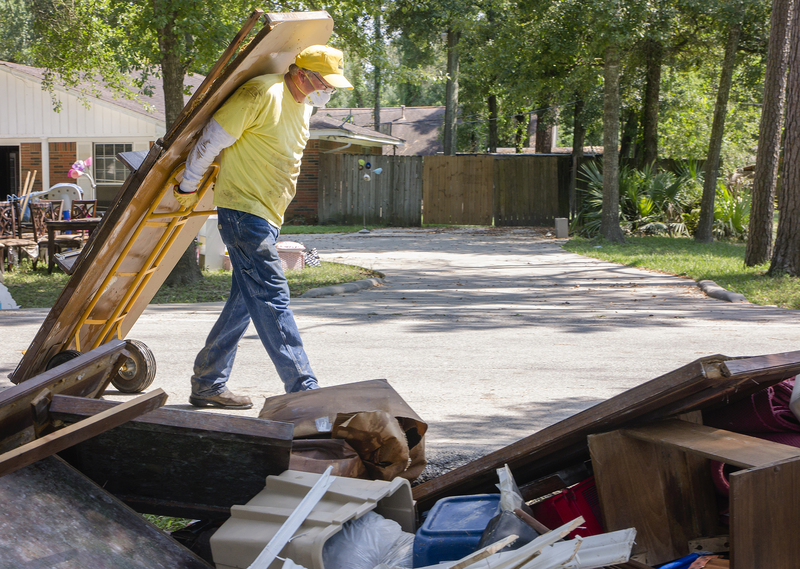 Receiving presidential praise was a big moment in a big year for SBC disaster relief, which also celebrated its 50th anniversary and spent 500,000 hours tackling one of the worst natural disasters in American history. But changing the volunteer structure will easily have the biggest long-range effect. “We jumped in the deep end not knowing if we could swim,” said David Melber, who heads up the SBC’s disaster-relief efforts. The new system has some bugs in it, and has caused some anxiety, he said. The seeds were planted in 1967, with another Texas hurricane—Beulah, which spun off 115 tornadoes and killed almost 60 people. When it was over, a group of Baptist men were aghast at the wreckage. The group of men gathered up some ingredients and portable camp stoves, and headed to southern Texas. It wasn’t the first time Southern Baptists had thought to help out. In 1966, the Home Mission Board set aside $50,000 for pastors, missionaries, and churches hit by natural disasters. But the Texas men expanded the scope, offering immediate meals to anyone affected. They kept at it, four years later receiving $25,000 from a state mission offering, which they promptly spent on a used 18-wheeler. They converted it into a feeding unit, and used it to dish up 2,500 meals the next year after a flash flood in central Texas. Other states followed their example—four more started their own disaster-relief efforts by 1976; another nine joined by 1988. The grassroots growth could perhaps only have happened in the SBC. The Southern Baptist structure—decentralized authority and autonomous churches—works especially well for disaster relief. One of the lessons from FEMA’s mishandling of Katrina was “to distribute power out to the periphery as much as possible,” said Atul Gawande, author of The Checklist Manifesto. Those best able to respond quickly and effectively are nearly always on the ground and authorized to make decisions. The grassroots growth could perhaps only have happened in the SBC. So the Southern Baptists, with their state-convention-owned trailers and loosely organized chain of command, were ideally set up to respond to hundreds of local tornadoes and floods, an earthquake in Nicaragua (their first international response) in 1973, and a hurricane in Honduras in 1974. In 1984, the unofficial effort was large enough to require national coordination by the SBC’s men’s ministry. 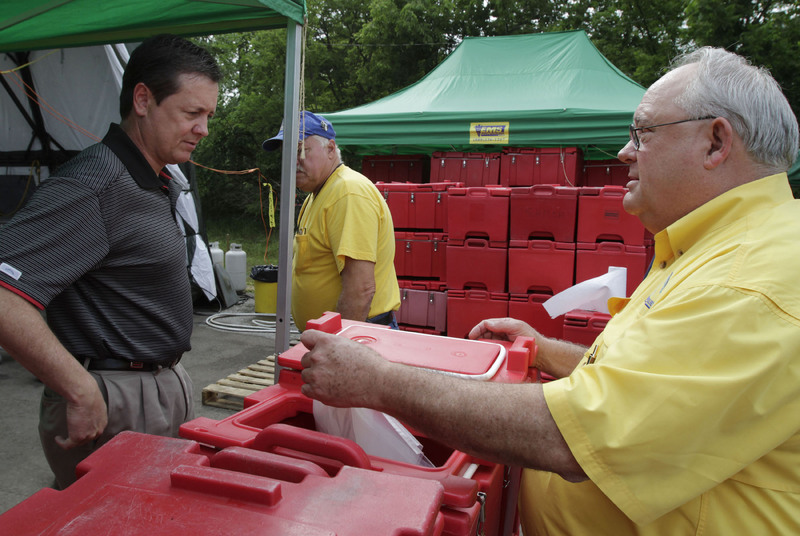 The Brotherhood Convention organized the activity for disasters needing a multiple-state response and also positioned the SBC to begin partnerships with national organizations—including both the Red Cross and the Salvation Army. Disaster-relief efforts measure time by disasters: If you ask NAMB for a history of theirs, they’ll give you a bullet list of bombings, hurricanes, floods, and earthquakes. Growth in finances and volunteers doesn’t rise slowly and steadily, but in surges after regional or national tragedies. For example, Hugo catapulted South Carolina’s state response team into existence. Over the next 20 years, the state went from zero to 6,800 volunteers. At the same time, they gained 129 “units,” which is what NAMB calls the trailers or trucks outfitted for a specific purpose—in addition to kitchens, some house rows of showers, washing machines, childcare areas, or cubicles with electricity and satellite phones for communication. Nationally, volunteer numbers also shot up after Hugo, then again three years later after Hurricane Andrew. Southern Baptists came “by the hundreds and multiplied hundreds every weekend,” said Cecil Seagle, director of the Brotherhood Commission for the Florida Baptist Convention, in 1993. Disasters “bring attention the need, and people want to do something,” NAMB spokesperson Mike Ebert said. By 1997, the SBC had more than 13,700 volunteers. By 2000, it had nearly 21,000. By 2004, it was up to about 31,000. Then Hurricane Katrina pounded into Mississippi, and blew previous volunteer efforts—even September 11—out of the water. Over seven months, 21,000 volunteers served 14.6 million meals in New Orleans (up from 2 million in 2001 and 3.5 million in 2005) and spent 1.5 million hours caring for 7,800 children, mudding out 17,000 buildings, and doing 27,800 loads of laundry. They purified 21,600 gallons of water and sent more than 3,000 ham radio messages. 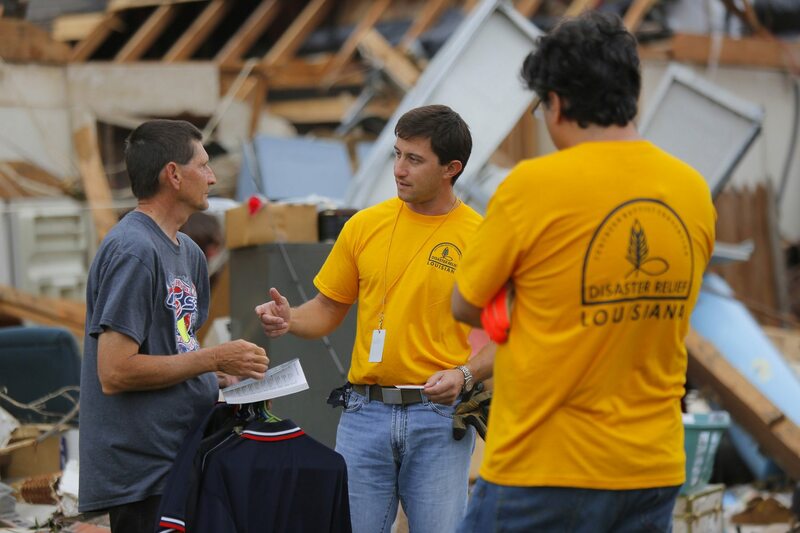 In the months after Katrina, 25,000 new volunteers were trained, nearly doubling the volunteer base of 31,000 from the year before. Partnerships with the Red Cross, the Salvation Army, and Federal Emergency Management Agency (FEMA) were also growing. The four saw each other again and again after floods, fires, and storms. Each time they met, the organizations refined their roles a little more. 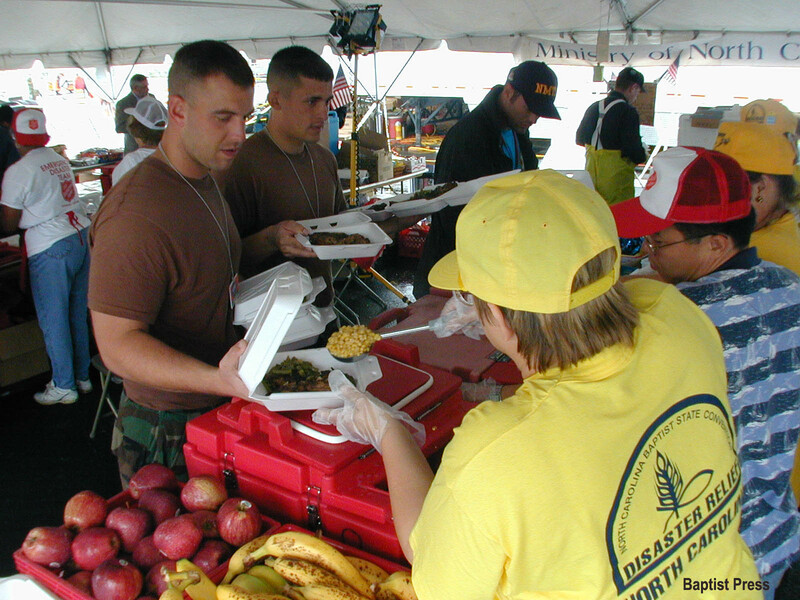 Every hot meal [the Red Cross] serve[s] in a disaster setting in the United States is prepared by Southern Baptists. And when FEMA assesses a neighborhood for damage, it hands the list of addresses and needs over to the SBC and the Red Cross, who split it up. That way, “there’s not a lot of overlap,” Ebert said. The Red Cross primarily provides emergency medical care, sets up temporary shelters, hands out meals, and occasionally offers financial help. 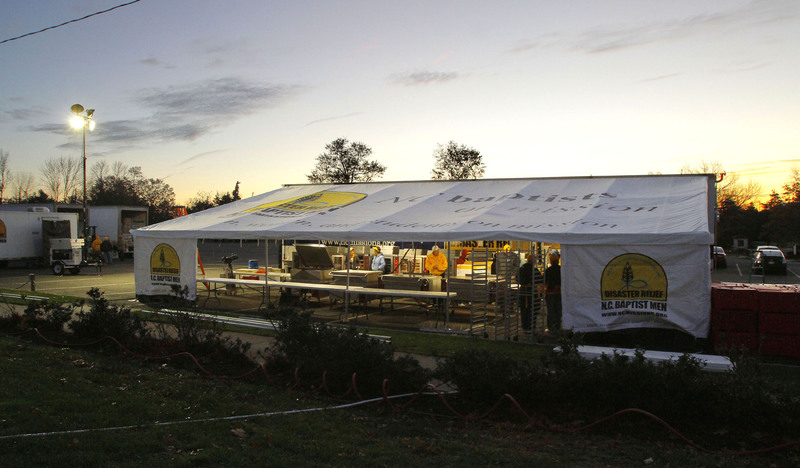 The Southern Baptists cook the meals, help with cleanup and repairs, provide water and showers, and offer trained childcare. 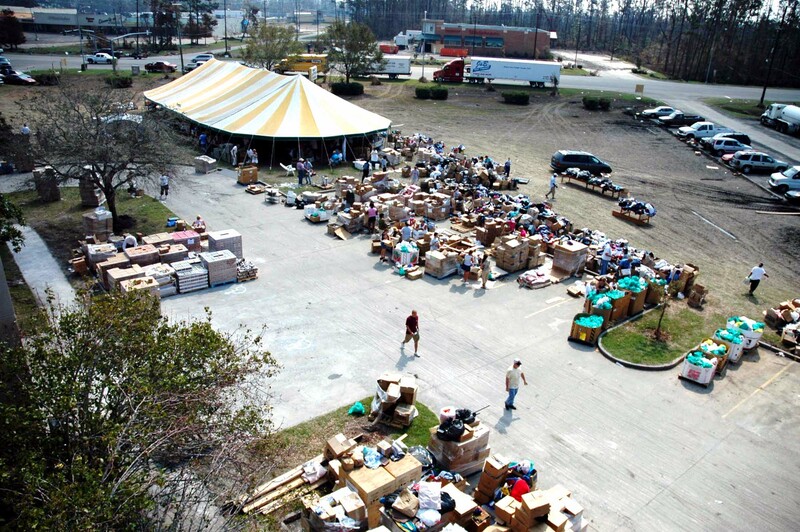 Post-Katrina was a high point in SBC disaster relief. In four years, the number of volunteers just about tripled—from 31,000 in 2004 to 90,000 in 2008. The number of response units jumped from 586 in 2004 to 2,000 in 2008. And then the numbers started falling; NAMB saw a drop of30,000 in trained volunteers over the next five years. Over roughly the same time period, the SBC lost more than a million members (from 16.3 million in 2003 to 15.2 million in 2016), including almost 78,000 in 2016 alone. But Ebert doesn’t think the drop in volunteers is linked with the drop in overall membership—after all, there are still more than 15 million Southern Baptists. Rather, he points to the lack of really big events—the size of Andrew or Katrina—that draw attention to volunteering. Another issue is generational. “Most of our active volunteers are older,” he said. It makes sense—their schedules are a lot more flexible than younger people tied down by school, work, or young children. But “as that generation transitions, the younger generations don’t seem to be showing as much interest in traditional [disaster relief] training,” he said. It’s not that Millennials don’t want to volunteer. Among those under 35 who gave to the Evangelical Council for Financial Accountability’s charities in 2016, 29 percent also looked for volunteer opportunities, compared to 20 percent of those over 35. But they’re also far more likely (45 percent) than Baby Boomers (28 percent) or even Gen-Xers (37 percent) to say their generosity is “always” or “often” spur of the moment. 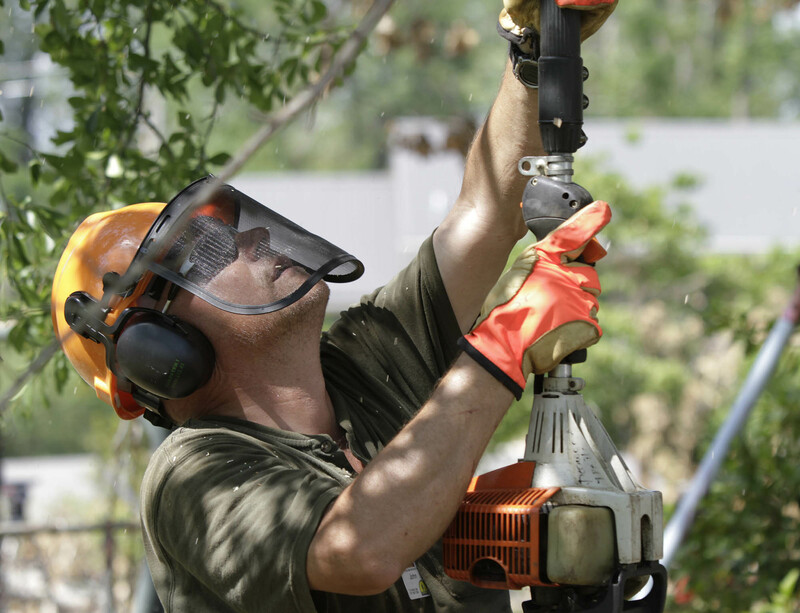 So one of NAMB’s tasks is to make disaster-relief volunteerism accessible more quickly—in essence, to recall those seat-of-the-pants, chainsaw-in-a-pickup days (although this time with safety goggles). 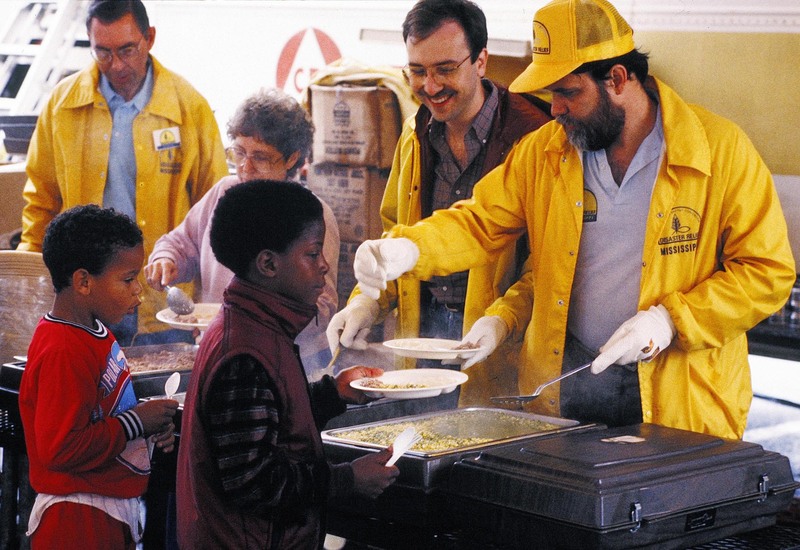 When Southern Baptists formalized disaster training in the early ’90s, people were able to get certified in areas such as running the kitchens, offering childcare, or working heavier equipment. That pre-training meant that when disaster struck, an army of volunteers already knew what to do. But requiring pre-certification also meant that people like Mike and Linda McDaniel couldn’t participate—at least not immediately, when disasters are on the news and interest levels are highest. NAMB president Kevin Ezell saw this problem a few years ago, when he was walking through tornado wreckage in Tuscaloosa, Alabama, and spotted a bunch of students hard at work. “I went over to thank them,” he said. He found out they were from a Southern Baptist congregation in Florida but were volunteering through Samaritan’s Purse because it didn’t require pre-certification. Ezell came back determined to tap into the market of willing but untrained workers. And this summer Send Relief—the brand-new home to all of the SBC’s mercy ministries—rolled out a system to do it. Send Relief’s first storm was a doozy. Harvey hit Texas three times, at one point putting more than one-third of Houston underwater. Almost 40 people were killed, and damage estimates are as high as $180 billion. Then, nine days after Harvey’s last flash floods, Hurricane Irma blew through Florida. Ten days after she settled down to 110 mph winds, Hurricane Maria spent 30 hours razing Puerto Rico. Send Relief offered immediate volunteer sign-ups online, getting people on the calendar as fast as possible—they have people signed up through November and over Christmas. Instead of hours of training, Send Relief played eight-minute safety videos and gave quick on-the-spot instruction. (Though Linda did notice the college students got a little longer orientation.) Seasoned volunteers in yellow shirts showed the new volunteers what to do. New volunteers weren’t always ready to run the kitchen equipment or the chainsaws, but not much education is needed for pulling out carpet or digging out debris. Shifting the demographic from those older than 60 (which make up more than a third of pre-certified volunteers, according to a survey of seven state conventions) to those younger than 30 (less than 3 percent) is also important when so much of the labor is physical, Johnson said. As the older people pass on their expertise, younger muscles make quick work. Opening up to untrained volunteers also positions Send Relief to accept non-SBC, or even non-Christian, volunteers. “When people think of a Southern Baptist church, they may think of something a little moldy, a little stuffy,” Ezell said. Inviting non-Christians to volunteer gives them an up-close experience with the SBC’s compassion work at the same time it gets more help to a hurting community. The ultimate goal is to “reach people,” whether that be disaster victims or volunteers, he said. Inviting non-Christians to volunteer gives them an up-close experience with the SBC’s compassion work at the same time it gets more help to a hurting community. That’s what SBC president Steve Gaines would describe as living “on mission,” his catchphrase for calling the denomination to refocus on evangelism. This fall, while they were cooking meals, tearing out carpet, and removing soggy sheetrock, disaster relief volunteers presented the gospel more than 2,500 times. They heard more than 400 professions of faith.